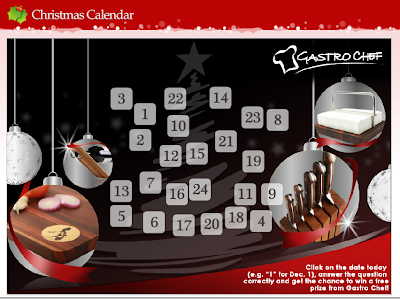 Christmas is just a few days away so I thought I would post this cool giveaway from GastroChef for your kitchen needs. It's called the Gastro Chef Christmas Calendar. All you have to do is register and log-in every day, click on the correct date and answer the survey question. You have 4 days to join. Winners will be drawn every weekday. Good luck!